Time for Art: A Celebration of Volunteers is right around the corner, and in addition to recognizing some of our community’s most dedicated volunteers, it will also highlight some incredibly talented artists from the area. From a five-foot-tall canvas and a homemade quilt to a 3D holiday ornament and a live edge coffee table, the variety of art this year is something you won’t want to miss. Majority of this year’s artists are returning, but we do have 11 new kids on the block. We had the chance to ask two new artists a few questions in anticipation for this Friday’s event. 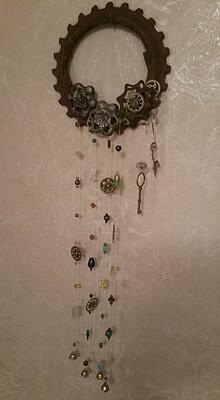 Say hello to Shannon Schlotfelt, who creates wind chimes and garden bits from re-purposed items. 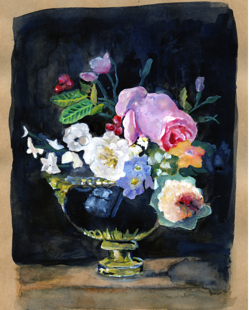 And Ivy Werner, who submitted two watercolor pieces for the event (you can check out one them here!). Shannon: Seeing the local art! I love seeing how much creativity we are surrounded by in this area. Ivy: I am most looking forward to seeing the art and seeing people come together to volunteer in our community. What motivated you to donate your art? Shannon: My family was affected by the 2008 flood and we received so much help and support, we pay it forward whenever we can. Ivy: I was nervous to put my art out but knowing what it does for the community really pushed me to contribute and be a part of it through my own talents. Shannon: It’s a blend of all the things I like; gardens, sparkly bits, re-purposing, and pretty sounds. My husband and son got me a DIY wind chime kit one Mother’s Day and I’ve been making all sorts ever since! Ivy: The two pieces that will be at the event are watercolor. I was inspired to do the still life from looking back at classical art and referencing one of my favorite periods of art history. The landscape I did was something out of my comfort zone, but I was really fascinated with the imagery.